Balcony windows allow you to unleash the potential of your loft conversion. They transform from a typical roof window into a fully-fledged balcony in just a few seconds. This provides you with a spot to indulge in the sun and provide added air flow throughout the summer. When closed, these balcony windows then fit flush with your roof for improved aesthetics. FAKRO have designed their balcony roof windows with the average homeowner in mind. They feature conveniently positioned handles and innovative supporting mechanism to make operation easy. When open, they provide a generously sized spot for you to stand and the sash can be rotated by 180 degrees for hassle-free cleaning. To view all FAKRO balcony windows simply click here. Have Questions About Our Balcony Windows? If you have more questions about our range of balcony roof windows, simply speak to our team online or by telephone. 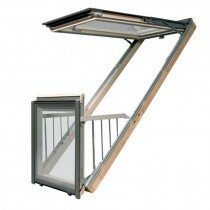 They’ll help you pick the ideal balcony window for your project and will ensure you have the appropriate flashing too.